Belur is the temple town of Hassan district in Karnataka. It is a prime tourist destination in South India because historically, Belur was the capital of Hoysala Empire. And this is reflected in the craftsmanship of the architecture in Belur. According to the inscriptions discovered in the town, it was referred to as Velapuri. Located approximately 250 km from Bangalore, which takes around 4-6 h to reach, Belur makes for a perfect religious destination on a long weekend. Hoysala Mahotsava is an extravagant dance festival that happens in both Belur and Halebeedu, the towns of Hoysala's era, in the month of March. The festivity includes performances by traditional dancers. Both the towns are lit with lamps and resonant with the celebration. The best time to visit Belur is from October to February. However, if you wish to witness the Hoysala Mahotsava, then March is preferable. Although the first route is the fastest, Route 3 has more places to see, we'll, therefore pursue this virtual journey on Route 3.Should you decide to take Route 2, don't miss Savandurga Hills and Magadi on the way. Savandurga Hills, located on Route 2, is one of the most challenging places of trekking. It is considered to be the largest monolithic hill in Asia, with height up to 1226 m above sea level, forming the Deccan plateau. It is formed by two hills, locally known as Karigudda and Biligudda, which literally mean the Black Hills and the White Hills, respectively. A permit is required to trek on Karigudda because of its tough terrain increasing its difficulty, whereas Biligudda is relatively easier to climb and has a properly marked trail. Magadi is a small town, located about 20 minutes from Savandurga Hills, also found on Route 2. Sri Someshwara Temple which dates back to the 16th century is said to be built by Sri Kempe Gowda in the year 1512. This temple also reflects the Hoysala style of architecture, which can be observed through the sculptures and pillars of the temple. Ranganatha Swamy Temple is another important temple, built in the 12th century by Chola dynasty and later additions were made by Vijayanagar Empire, Tipu Sultan and Mysuru Wodeyars. Ramanagar was originally known as "Shamserabad" during the rule of Tipu Sultan and later as "Closepet" during the pre-independence period in India. It is a district for Ramanagara, Kanakapura, Channapatna and Magadi Taluks. Ramanagara is well-known for Ramadevarabetta, a popular spot for trekking, rock-climbing and rappelling. The district is home to some of the endangered species of birds such as Long-Billed Vulture, Egyptian Vulture and Yellow-Throated Bulbul, and is ideal for bird-watchers. Maddur houses an ancient Jain Temple that dates back to almost 8th century AD, discovered by the Archaeological Survey Of India. This 100 ft long and 40 ft wide structure, was built with stones and bricks. A sculpture of Bahubali was also discovered at the site. Maddur also has beautiful places of worship, some of which are- Sri Vardaraja Swamy Temple, Sri Ugra Narasimha Swamy Temple and Maddur Mosque. Mandya, a town very close to Maddur is famous for Mallikarjuna Temple at Basaralu, built by Harihara Dannayaka, an artisan of Hoysala Period, in the 13th century. It illustrates parts of Ramayana, Mahabharatha, and several other Puranic episodes through the sculptures of lions, birds, mythological Heroes, Gods and more. 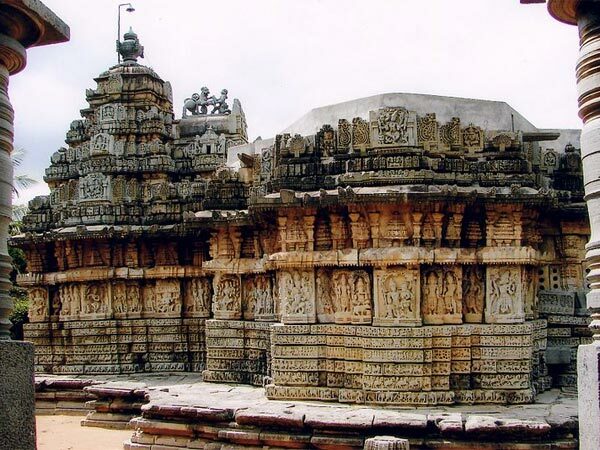 Situated about 60 km from Maddur and 88 km from Hassan, is the temple village Melukote. It is one the sacred pilgrimages of Karnataka. The glorious Cheluvanarayana Swamy Temple, built on rocky hills known as Yadavagiri, is dedicated to Lord Vishnu. Vairamudi Seva during April-May is the most famous festival here. Yoganarasimha Swamy Temple is a monumental structure standing on a hill, built 1777 m above the sea level. The architectural significance of this religious place is what makes it more famous.Raya Gopura, a ruin of four tall pillars and a few other temples are the places to be visited at Melukote. Shravanabelagola is another small town of historical importance found on the way, located 35 km from Melukote. It is the most popular Jain pilgrimage in South India, with the largest number of Digambara Temples and inscriptions in the country. Shravanabelagola is famous for the Gomateshwara Statue, which is a statue of Lord Bahubali, that is the tallest monolithic stone statue in the world!! This enormous statue is carved from a single block of granite, which is 58 feet high and stands at an altitude of 3,347 ft on the Vindhyagiri Hills! Be ready to climb over 600 steps to this magnificent sight. Another town of beautiful temples is Channarayanapatna. Lakshmi Narasimha Temple and Sadashiva Temple in Nuggehalli are the two most-visited temples by tourists. These temples belong to the 11th century Hoysala period, another relic from a bygone era, which also shows the richly decorative architecture of the Hoysala dynasty. The village of Shettihalli is found at a distance of 56 km from Channarayanapatna. This village is famous for the Shettihalli Rosary Church. Interestingly, this church was built by French Missionaries in India, in the 1860s and reflects awe-striking Gothic Architecture. It is now a half-submerged church, left abandoned after building the Hemavati Dam and Reservoir. Nevertheless, this ruined church is a spectacular construction that still attracts a lot of visitors. Ruled by one too many dynasties, Hassan is remembered for being the seat of the Hoysala Empire, which ruled large parts of South India. This district was named after the presiding deity of the town, Goddess Haasanamba. Belur, which was the former capital of Hoysala Empire, is the final destination of this serene pilgrimage. Belur is famous for the Chennakeshava Templeand the mastery of its stonework and Hoysala Period's work of art. It was built by the Hoysala King Vishnuvardhana, on the banks of Yagachi River. The temple complex, sculptures, pillars and shrines of this spot tell you the fantastic work of artists of that era. The Hoysala artists have signed their work in the form of inscriptions on the walls of this temple.